Chilled watermelon “Kool-aid” with blueberry preserves and mint. Chilled watermelon “Kool-aid” with blueberry preserves and mint. Photo by Christopher Anderson. Lindale Park, the neighborhood east of Interstate 45 just north of downtown Houston, is now home to Indigo, a soul food restaurant with a fine dining approach. It is located at 517 Berry and operated by fine dining chef Jonny Rhodes, whose career includes time in the kitchens of Oxheart and New York’s Gramercy Tavern. He grew up in Lindale Park and sees his new restaurant as a catalyst for change in his childhood neighborhood. Houston is no stranger to soul food and diners have been enjoying macaroni and cheese, banana pudding, oxtails and smothered pork chops thanks to places like This Is It Soul Food, Mikki’s Soulfood Café and Just Oxtails Soul Food. It’s a cuisine that has been in existence for hundreds of years and differs from the broader category of Southern food. There’s more integration of capsicum pepper heat and greater utilization of offal, like pigs’ feet and ears. It’s long been perceived as hearty, rib-sticking fare and Rhodes wants diners to start seeing it in a different way. Indigo is presenting it fine-dining style by way of two different tasting menus. Chef Jonny Rhodes inside his new restaurant, Indigo. Photo courtesy of Christopher Anderson. During the Great Migration, newly freed African Americans fled north and brought their cuisine with them while facing new challenges of survival. Techniques like pickling, curing, and smoking were vital to preserving the food supply. According to author and James Beard Award-winner Adrian Miller, the term “soul food” didn’t became popular until the 1960s. “Soul” became a label synonymous with all aspects of black culture, from music to fashion and food. Businesses in Lindale Park, a blue-collar neighborhood, include convenience stores, taquerias, and automotive services. 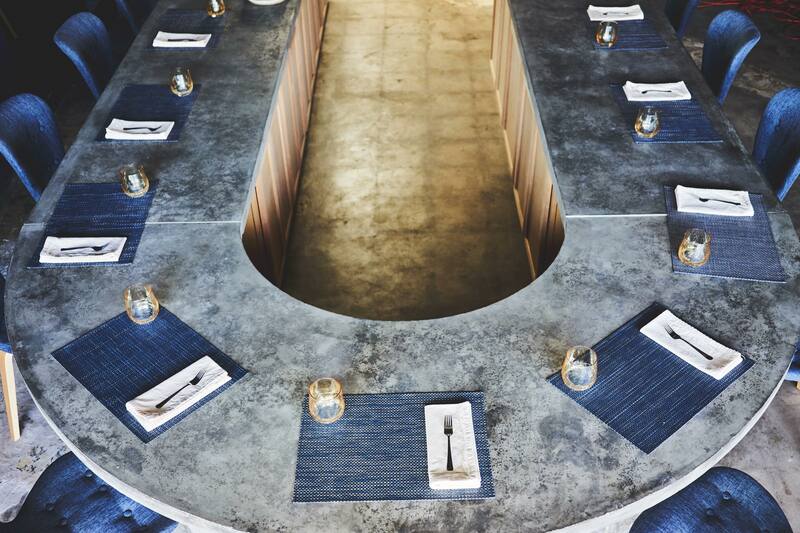 Indigo’s 13-seat dining room contrasts starkly to the neighborhood outside. It is designed to create intimacy and a feeling of unity that is at the heart of soul cooking. The place settings, chairs and walls are all in shades of dark blue, which creates a welcome calming effect given soul food’s emphasis on spice. Guests sit around a U-shaped counter overlooking the kitchen, which allows the staff to interact freely and answer questions about each dish. 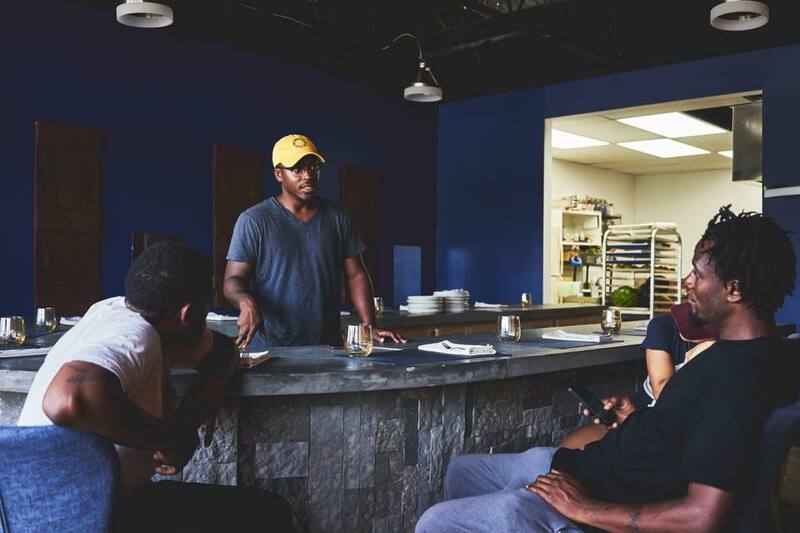 Rhodes wants the space to create conversations that redefine and differentiate soul cuisine from the broader category of Southern cuisine. More than three years of research went into the concept as Rhodes wanted to include the contributions of both African Americans and indigenous Americans into the cuisine. “Collard greens are a New World crop and it was indigenous Americans who taught African slaves how to prepare them, so we want to celebrate all of the influences that have led to soul food and neo-soul food’s creation,” explained Rhodes. Diners have a choice between two 5-course menus: the Omnivore, which includes meat, and the Herbivore, which is vegetarian and celebrates the importance of vegetables to soul food. Seating at Indigo features a 13-seat communal u-shaped bar for interaction between guests and staff. Photo by Christopher Anderson. Both menus feature ingredients preserved through pickling, curing, smoking or canning. There are dishes repeated across both menus such as the Cooper Sun, with pickled, smoked carrots and allium clippings, and the Affirmation of a Stereotype, a chilled watermelon soup with blueberry preserves and mint. Each menu is $79, a fact that Rhodes hopes won’t deter the surrounding community from visiting Indigo. Rhodes also mentioned that a grocery store is needed in the area and he’s looking forward to being part of that change and combating the difficulty in getting fresh ingredients into the neighborhood. “We hope to be a stepping stone to other businesses and opportunities for the community,” he said. 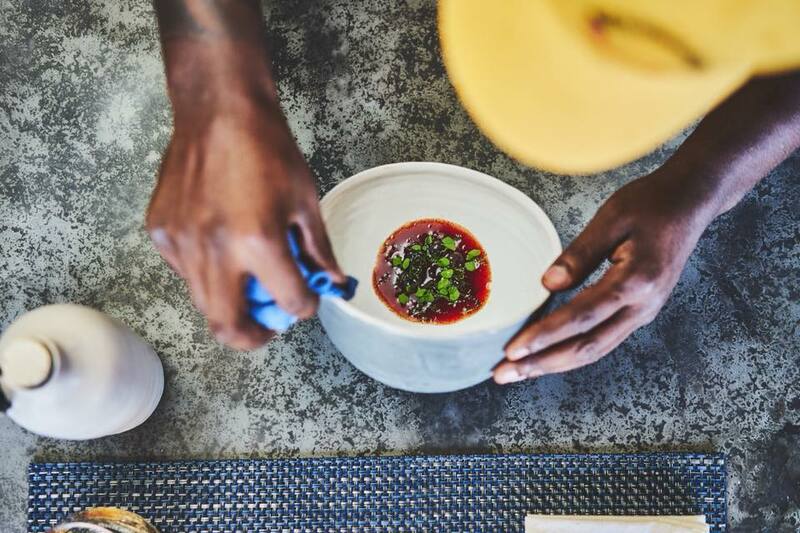 Rhodes wants Indigo to become an exciting destination where Houstonians can gather to discuss ideas while enjoying a flavorful and thought-provoking meal. The familiar flavors of soul will bring Lindale Park’s culinary scene into the future by celebrating its past. Nice concept but price point is going to be an issue. Good luck and hope your business much success!